The Rest of Us Just Live Here is a post-modern suburban-fantasy teen novel. Set in a world where, every generation or so, some big supernatural events occur which happen to be solved by teenagers, the book focuses on the regular teens instead. The 'indie kids' are the ones who have the grand, world-saving adventures with zombies or vampires or Gods or aliens or multidimensional whatsits. Everyone knows who they are - the ones who keep themselves apart and whose names are pretentious and hipster-y. The ones who go through life-or-death stuff a lot, while forming their little Scooby Gangs, staying off the internet and Twitter and not really telling anyone else what's going on. The Rest of Us Just Live Here is a much more serious teen novel than it sounds like from the blurbs. Each chapter starts with a one-paragraph summary of the 'indie kid' story that happens simultaneous to whatever Mikey's experiences are, but it's Mikey's everyday problems that the novel is built on. Occasionally, Mikey's path intersects with indie kid events, and his friends speculate about what this year's big hoo-hah might involve, but mostly, they try to avoid being caught up in those things. After all, who wants to be collateral damage? Really, it's a novel about the transition that takes place at the end of school. These teens are about to have one of the biggest changes of their lives - from living at home with their parents and being surrounded by kids they grew up with to being thrown into a mix with strangers and living on their own - and they are half-excited, two-thirds-terrified. Some of them are damaged (Mikey has OCD episodes, his sister Mel once had a heart attack due to anorexia and malnourishment), and the relationships they have with each other don't fit the fairy tale stereotypes. There've been sexual experiments, there's been flirtations with polyamory, there is jealousy and awkwardness. It's also a novel about anxiety and self-loathing and trying to deal with those. Mikey's jealous, often passive-aggressive or outright hostile, and self-consciously needy. He feels like he is always at the edges of his group of friends, the least necessary one, the one all the others could do without. I found this book a hard read. The prose is easy, and the characterisation is spot on, but that's what makes it hard. It resonates. I remember that time all-too vividly. Mikey's view of himself resonates all the more, even now. Meanwhile, the indie kid events are told with a certain amount of spite. This does not feel like the affectionate satire that stories like Redshirts and Galaxy Quest have mastered. This parody seems to resent the Buffys and Harry Potters and Twilights and Veronica Marses of the universe. Whenever they sit around to ponder events they do so with mocking extra corny adverbs in the description. They have the life-and-death adventures, they do their teenage moping and they keep themselves apart. They're walking talking parodies. No one minds much that so many of them die: it's expected. 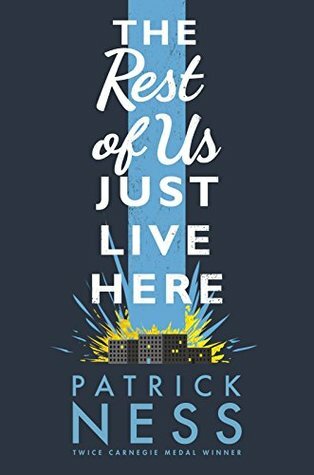 Patrick Ness is a hugely talented author, and this book does exhibit truckloads of writerly craftsmanship, with spot-on characterisation, authentic dialogue, and a terribly smart understanding of teenagers. All of which makes this a literary achievement - but my desire to have fun and be entertained was disappointed by the novel. It's too serious for its premise. I'm conflicted - your descriptions of these YA novels sound very appealing to start with (presumably why you read them) but all the heavy teen-angst starts to put me off, mainly because I hate being reminded of my teen years, since they were so, huge shock, miserable. That's pretty much exactly how I felt about the book after reading it.